1 Doctor of Physical Therapy Program, University of Vermont, Burlington, Vermont, USA. A 37-year-old male machine operator presented with acute thoracic spine and left middle rib pain following a rotatory mechanism of injury at work. 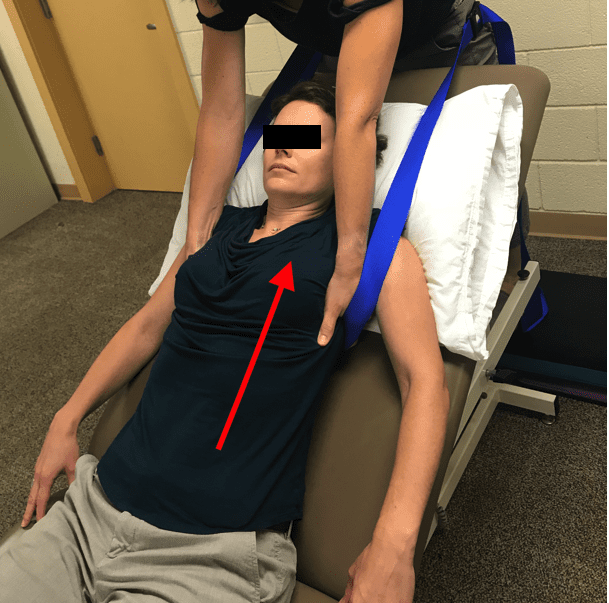 Following clinical examination, the physical therapist identified the thoracic intervertebral disc (IVD) as the primary source of the patient’s pain given severe pain provocation with thoracic rotation and positive dural tension signs. The patient responded well to thoracic IVD decompression, IVD hydration management and direct treatment to the left 8th rib costochondral junction with full resolution of thoracic spine pain after 4 physical therapy visits. The patient was able to return to work and his pre-injury activities without restriction at the end of his physical therapy plan of care. The purpose of this case report is to (1) demonstrate the utility of a systematic examination of the thoracic spine and ribs for prioritizing intervention strategies, and (2) describe a successful course of treatment that included manual therapy and home program recommendations following an acute thoracic IVD lesion. 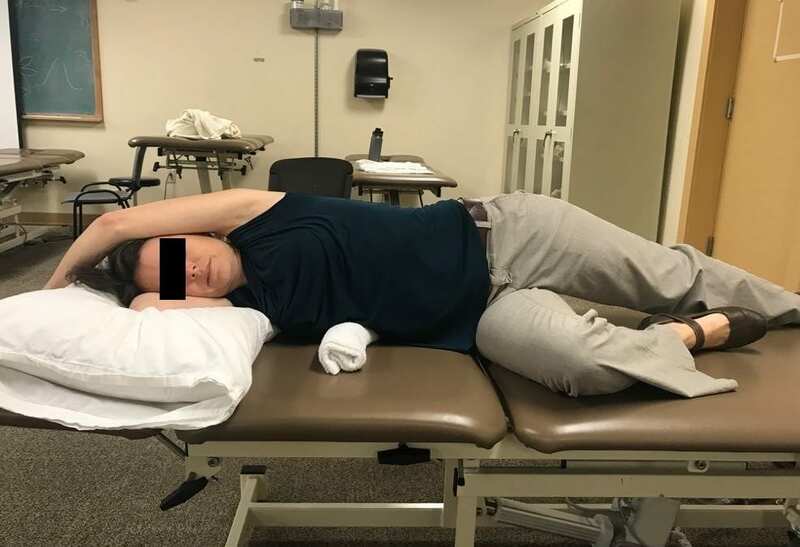 The patient, a 37-year-old male heavy machine operator, presented to physical therapy (PT) with left anterolateral trunk pain following an injury at work 6 days prior to his initial evaluation. He reported pulling with maximum effort on a wrench while working on a 400-ton hydraulic press and felt a pop in his trunk. He attempted to continue working and was unable due to pain in his midback and left sided ribs. He was seen by primary care for radiographs, which revealed no acute, displaced rib fractures. 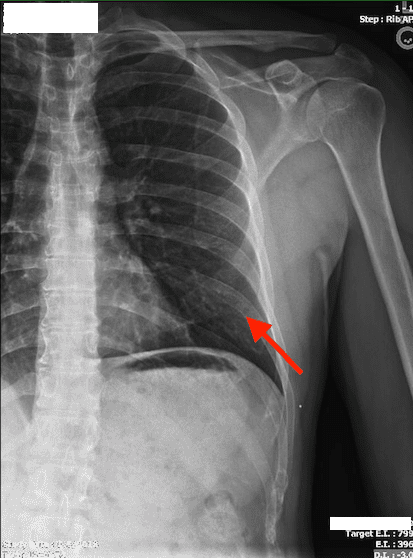 The primary care provider referred the patient to PT with the diagnosis of rib sprain. Upon initial evaluation, he reported a constant dull aching pressure in the left anterolateral ribs that became sharp with movement. He rated his pain on the Numeric Pain Rating Scale (NPRS) as 3/10 at best and 6/10 at worst. Aggravating factors were coughing, deep breathing, lying supine and in left side lying. He reported difficulty turning in bed and demonstrated pain behaviors such as grimacing when transferring on and off the treatment table during the initial examination. The patient described a secondary pain between his scapulae characterized as a deep fatigue. His medical history included L5-S1 discectomy in 1998 complicated by a dural leak requiring a second surgery. Otherwise, the patient was healthy and fit, reporting regular exercise 5-7 days/week. 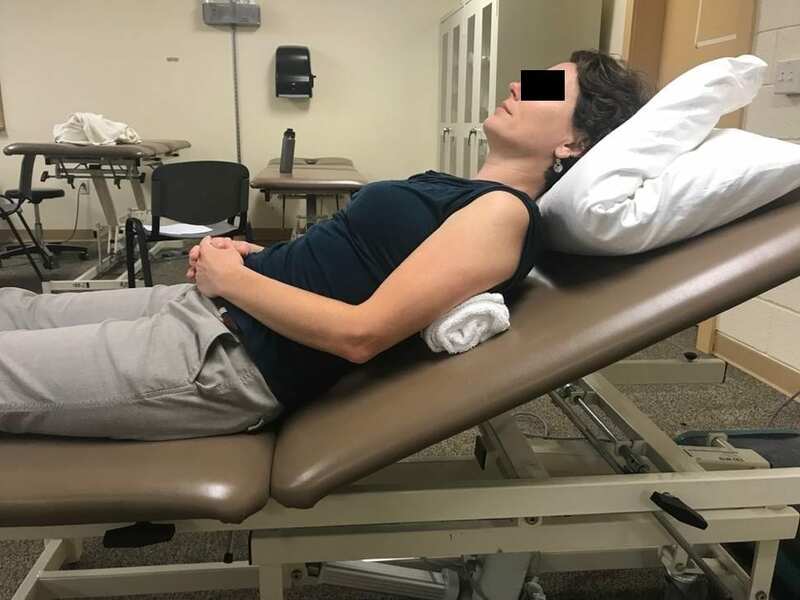 Prior to testing, visual patient observation revealed guarded posture with rounded shoulders and decreased lumbar lordosis. Swelling over the left 8th rib costochondral junction was visible and palpable. The cervical spine was screened to rule out cervical spine involvement. No limitations were found and no pain was provoked with cervical spine examination. Thoracic spine motion was moderately limited in all directions. The patient reported mild pain with thoracic flexion and cervical flexion testing was positive for reproduction of left sided rib pain. He reported moderate pain with thoracic side bending, left more than right and severe pain with thoracic rotation, left more than right. Active thoracic rotation motion to the left was the most painful test. Resisted thoracic isometrics were strong and painless with the exception of mild pain during resisted side bending bilaterally. Slump testing was positive bilaterally with concordant sign in the left anterolateral 8th rib, which decreased with left ankle plantarflexion. Patient reported hypersensitivity to light touch with palpation along the 8th rib and exquisite pain to palpation at the costochondral junction. Pain was not reproduced with rib springing. Posteroanterior spring testing to the spinous processes of the thoracic spine was not performed due to the patient’s unwillingness to lie prone secondary to pain. Lower extremity sensation and deep tendon reflexes were intact and symmetrical. The Modified Oswestry Low Back Pain Disability Index (MODI) score was 24% out of 100%, where 100% indicates total disability. Physical therapy was recommended twice weekly with a treatment priority of spinal decompression6 to unload the thoracic IVD, as well as manual therapy and anti-inflammatory measures to reduce local rib pain and inflammation. Thoracic spine and rib pain decreased immediately during axial separation at the first visit (Figure 3). 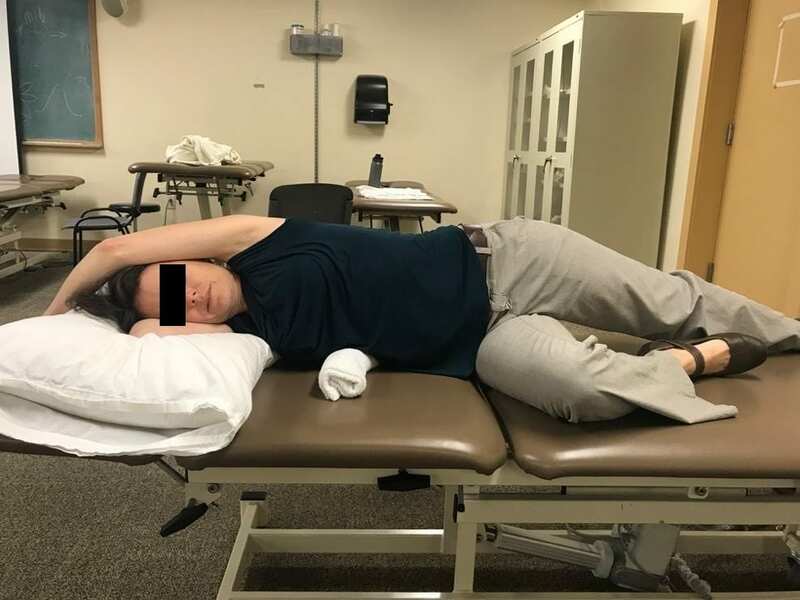 The patient was given instructions to perform 3-dimensional axial separation at home in right side lying (Figure 4) and thoracic IVD hydration management6 with a towel roll at T8 in a reclined position (Figure 5). Direct treatment to the left 8th rib costochondral junction included cross fiber massage (Figure 6) and iontophoresis with dexamethasone. The patient was seen for a total of 4 PT visits. At his second visit, the swelling along the 8th rib had resolved and his thoracic pain had decreased to intermittent and 3/10 with thoracic rotation. At his fourth visit, he reported no pain in his thoracic spine and rib pain was minimal. The patient was transferring in and out of bed with no pain and he stated feeling ready to resume working out. He did not return to PT after his fourth visit due to his return to work. 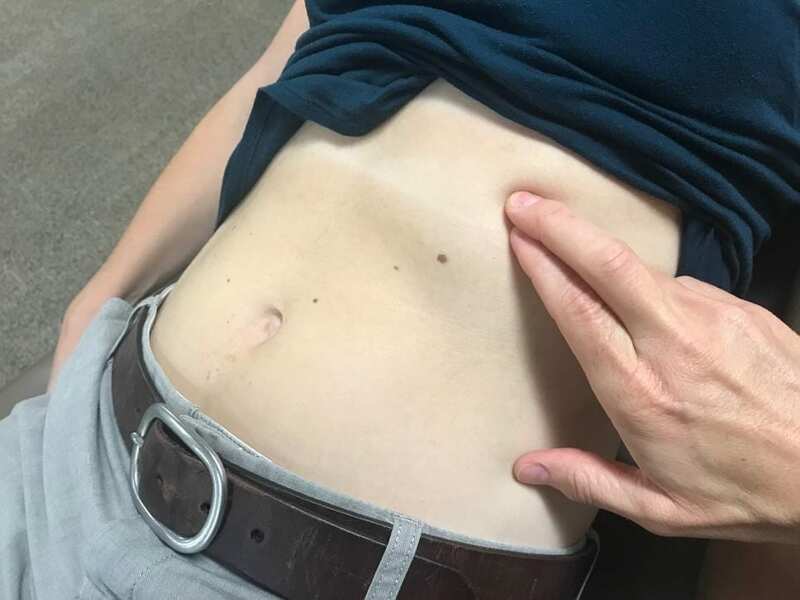 Five months following the patient’s last PT visit, he reported 0/10 thoracic and left rib pain, a Modified Oswestry Disability Index score of 0% disability and full return to work without restrictions. He was able to resume all pre-injury activities with no pain. Biomechanical considerations supporting the diagnosis of acute thoracic IVD lesion in this case include evidence that the instantaneous axis of rotation for thoracic rotation is located in the posterior IVD.10 Consequently, segmental thoracic rotation, which is primarily controlled by the IVD, can provoke pain in the presence of IVD lesion.11 In addition, given the rotatory nature of this patient’s mechanism of injury, it stands to reason that the IVD sustained a pathological load leading to a painful condition. The costochondral sprain was secondary to the complaints related to the thoracic IVD. Biomechanically, the ribs limit thoracic side bending range of motion.12 Consequently, primary rib injuries typically present with large, painful limits in thoracic side bending motion. Although this patient presented with evidence of tissue inflammation at the level of the rib, thoracic rotation and tensioning of the dural sac were more provocative of the patient’s pain. Successful identification of the primary pain generating structure allowed for prioritizing management strategies. The patient responded well to IVD unloading and hydration management with full symptoms resolution. The acute nature of the case and the fact that the patient likely would have improved regardless of treatment is a limitation of this study. Addressing the costochondral injury with measures that decreased inflammation and promoted tissue healing helped to fully resolve the patient’s painful symptoms allowing him to return to his fitness and work activities with no restrictions. This case provides support for precise diagnosis and identification of pain generating structures in order to design plan of care. Larger trials are necessary to assess causation and if such treatment strategies are effective to manage patients with thoracic IVD conditions. Briggs A, Smith A, Straker L, Bragge P. Thoracic spine pain in the general population: Prevalence, incidence and associated factors in children, adolenscents and adults. A systematic review. BMC Musculoskel Dis. 2009;10:77. Chiu KY, Luk KD. Cord compression caused by multiple disc herniations and intraspinal cyst in Scheuermann’s disease. Spine. 1995;20(9):1075-1079. Delitto A, George S, Van Dillen L, et al. Low back pain clinical practice guidelines linked to the International Classification of Functioning, Disability and Health from the Orthopedic Section of the American Physical Therapy Association. J Orthop Sports Phys Ther. 2012;42(4):A1-A57. Sizer P, Mauri M, Learman K, Jones C, Gill N, Showalter C, Brismee JM. Should evidence or sound clinical reasoning dictate patient care? J Man Manip Ther. 2016;24(3):117-19. Sizer P, Phelps V, Azevedo E. Disc related and non-disc related disorders of the thoracic spine. Pain Prac. 2001;1(2):136-149. Winkel D, Aufdemkampe G, Matthis O, Meijer O, Phelps V. Diagnosis and treatment of the spine: Nonoperative orthopedic medicine and manual therapy. Austin, Texas: Pro-ed, Inc.; 1996. Lopez V, Ma R, Li X, Steele J, Allen A. Costal cartilage fractures and disruptions in a rugby football player. Clin J Sports Med. 2013;23(3):232-4. Schellhas K, Pollei S, Dorwart R. Thoracic discography: A safe and reliable technique. Spine. 1994;19:2103-9. Ross JS, Perez-Reyes N, Masaryk TJ, Bohlman H, Modic MT. Thoracic disk herniation: MR imaging. Radiology. 1987;165(2):511-515. White A, Panjabi M. Clinical Biomechanics of the Spine. 2nd ed. Philadelphia, Pennsylvania: Lippincott; 1990. Mellion L, Ladeira C. The herniated thoracic disc: A review of literature. J Man Manip Ther. 2001;9:154-163. Takeuchi T, Abumi K, Shono Y, Oda I, Kaneda K. Biomechanical role of the intervertebral disc and costovertebral joint in stability of the thoracic spine. A canine model study. Spine. 1999;24(14):1414-1420. Figure 2. Plain radiograph oblique view showing the thoracic spine and left ribs. 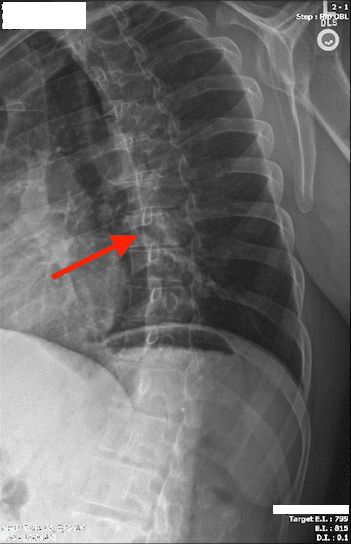 Arrow indicating the 8th thoracic vertebral body. Figure 3. Axial separation belted dorsally to emphasize the midthoracic spine. Pillow used to maintain thoracic kyphosis. Figure 4. 3-Dimensional axial separation performed with the painful side up and ipsilateral rotation (left rotation for left thoracic pain). Patient was instructed to lie in this position 1-2 times per day for 10-15 minutes as tolerated. Figure 5. Thoracic disc hydration management. The patient was instructed to lie in a reclined position with a towel roll at T8 for 10-15 minutes to reduce midback pain and stiffness. Figure 6. Cross fiber massage to the costochondral junction of the left 8th rib. Performed for 2-3 minutes.